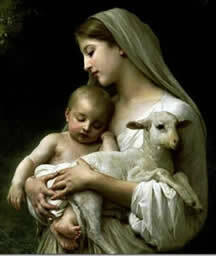 In the Blessed Mother’s person, she is the model and perfection of what the Church will become in eternity. She is the Father’s masterpiece, the “mold” that the Church is, and is to become. In His encyclical, Redemtporis Mater (“Mother of the Redeemer”), John Paul II notes how Mary acts as a mirror of the mysteries of God. Thus, the Church can see herself in the “pattern” of Mary. 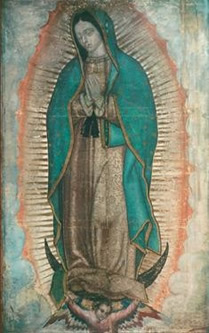 But then, Mary too can be seen in the image of the Church. It is in this mutual reflection that we can learn more of Mary’s mission to us, her children. 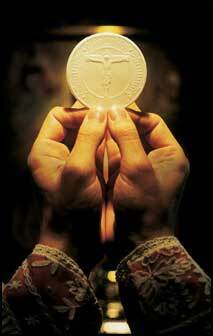 The Church feeds us the bread of the Word, and we are nursed with the Blood of Christ. What, then, are the ways in which Mary “nurses” us, her children? We believe in one, holy, catholic, and apostolic Church. —approved in amplified form at the Council in Constantinople, 381 A.D.
One could say that the role of Mary in a believer’s life is to bring about these four attributes individually in each soul. She takes into her hands the bread and wine of our human nature, and through the power of the Holy Spirit united to her maternal intercession, we are made more and more into another “Christ,” and thus enter more deeply into the “One” that is the Holy Trinity; more “one” with our brother in need. And just as the Church becomes “one” with the Eucharist she consecrates, to too we become “one” with Mary, particularly when we are consecrated to her. 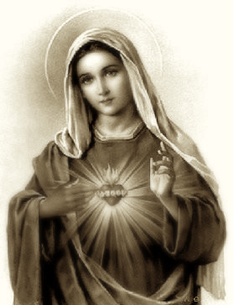 He wants to establish in the world devotion to my Immaculate Heart. I promise salvation to those who embrace it, and those souls will be loved by God like flowers placed by me to adorn His throne. —Blessed Mother to Sr. Lucia of Fatima. This last line re: “flowers” appears in earlier accounts of Lucia’s apparitions; Fatima in Lucia’s Own Words: Sister Lucia’s Memoirs, Louis Kondor, S.V.D., p, 187, Footnote 14. Just as Mary accompanied Jesus to the Cross, she accompanies each of her children to the Cross, to embrace one’s own total self-sacrifice. She does this by helping us to make her fiat our own: “May it be done to me according to your word.” Luke 1:23 She leads us along the way of repentance and dying to self “so that the life of Jesus may also be manifested in our body.” 2 Cor 4:10 This life of Jesus lived according to and in God’s will, of becoming ourselves humble “handmaids of the Lord,” is the fragrance of holiness. Birthing and labor pains are symbols of the Cross and Resurrection. As we are “consecrated” to Jesus through Mary, she accompanies us to Calvary where “the grain of wheat must die” and the fruit of holiness rise. This birthing is reflected in the mirror of the Church through the saving womb of the Baptismal font. Just as Mary made her own the mission of her Son, so too she will lead souls given to her to make their own the mission of Jesus. To make of them true apostles. Just as the Church is commissioned with making “disciples of all the nations,” Mary is charged with making disciples for all the nations. At the end of the Liturgy, the priest often dismisses the faithful, saying: “The Mass is ended. Go in peace to love and serve the Lord.” Believers are “sent” back into the world to carry the “Heart of Christ” they have just received into the marketplace. Through her mediation, Mary forms the Heart of Christ in believers, that is, the flame of charity, thus, uniting them to the universal mission of Jesus that goes beyond boundaries and borders. Thus, one could also say, “Where there is Christ Jesus, there is Mary.” In her subsisted the fullness of Christ’s body… she received from him “the fullness of grace” which he willed. How often have souls returned from Marian shrines around the world with a new love and fervor for the Church? How many are the priests I personally know who have said they found their vocation through “the Mother” while at her apparitions sites! She brings her children to Jesus where He is to be found: “Where there is Christ Jesus, there is the Catholic Church.” Mary would never contradict her Son who promised to build His Church upon Peter. This Church has been entrusted with the “truth that sets us free,” a truth the world thirsts for. 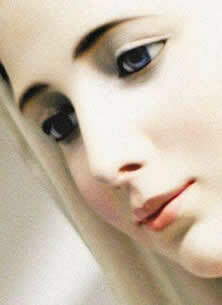 The Blessed Mother will go out to the soul consecrated to her, to “meet their desire” for truth. 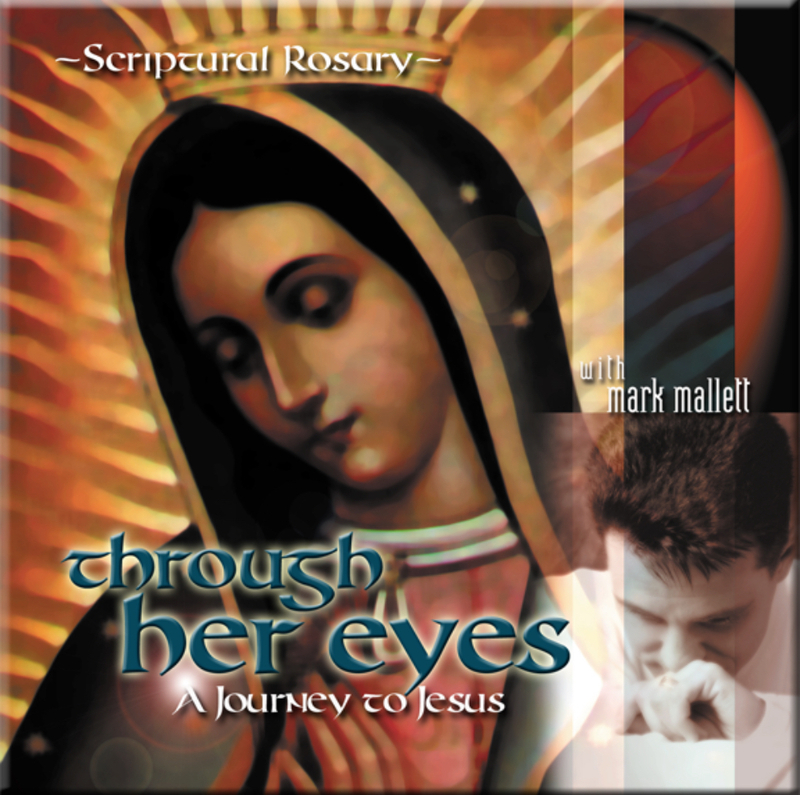 She will carefully guide the docile soul along the path of truth, as has been entrusted to the Church. As the Church nurses us at the breasts of Sacred Tradition and the Sacraments, so to our Mother nurses us at the breasts of Truth and Grace. While there always exists the possibilities of human freedom, and thus rejection of the truth, the soul praying with Mary has a special grace in dispelling heresy and error. How needed are these graces today! If Jesus is the Head of the body of Christ, then perhaps Mary is the heart. As “mediatrix of graces,” she pumps the superabundant merits of the Blood of Christ to all the members of the body. 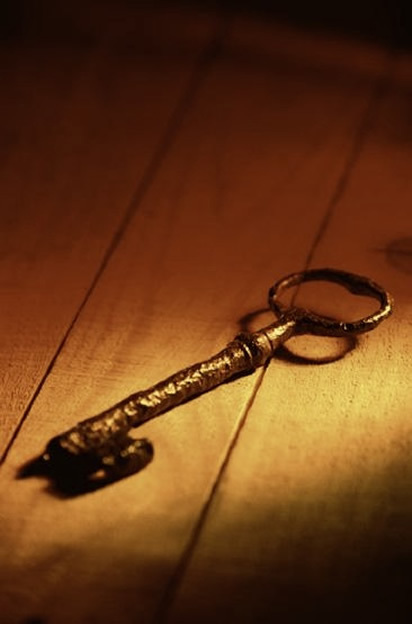 It is up to us each individually to open up the arteries of the “mind and heart” to this “gift” of God. Whether you receive this gift or not, she will remain your Mother. But how great a grace it will be if you welcome, pray with, and learn from her in your own home, that is, your heart. First published April 20th, 2011. Posted in HOME, MARY and tagged revelation, john paul ii, catholic, pope, benedict, catechism, MARY, woman, virgin, blessed mother, lumen gentium, advocate, mediatrix.